We will never forget her music. Welcome back again for another amazing journey into the music of Shirley Horn. These past couple of weeks have been filled with adventure as I discover old and new songs that I am hearing again or for the first time. This week’s radio blog features three songs that Shirley recorded on albums that were not her own. 01 – Shirley Horn – “Hit The Road Jack” from Light Out of Darkness: A Tribute to Ray Charles (1993) – Shirley and her sidemen (The Hornettes) swing on this Ray Charles classic gem. 02 – Shirley Horn – “You’re My Thrill” – from Your My Thrill (2001) – This song came from the 1933 screen comedy “Jimmy and Sally” and was memorably recorded by Billie Holiday. Shirley also recorded this song on her Softly album. Johnny Mandel again provides the rich orchestrations for this album as he did on her Here’s to Life album. This was also the last full length album on which Shirley played piano and recorded with her longtime bassist, Charles Ables, before he died in 2001. 03 – Shirley Horn – “Get Out of Town” from Close Enough for Love (1989) – Shirley swings hard on this Cole Porter song. 04 – Shirley Horn – “Once I Loved” – from Close Enough for Love (1989) – A double dose from this wonderful album. I love the way Shirley interprets a Jobim song. It is romantic and lush. 05 – Shirley Horn – “I Didn’t Know What Time It Was” from But Beautiful – The Best of Shirley Horn (2005) – This was one of the live bonus track that Shirley recorded at Au Bar in January 2005 in New York City. You can hear her having a fun time on this Rodgers and Hart classic. I loved her playful laughter at the end of the song when says “I love you” to trumpeter Roy Hargrove who performs an excellent solo here. 06 – Shirley Horn – ” Since I Fell for You” from Softly (1988) – This blues ballad was one of the most requested songs in Shirley’s club appearances. She builds the song into an intense climax. You can hear some influences of Ray Charles here as well. 07 – Shirley Horn – “All or Nothing at All” from The Main Ingredient (1996) – She recorded this album in her Washington, D.C. home in 1995. It features Joe Henderson and Buck Hill on tenor sax, Steve Novosel on bass, and the drum machine, Elvin Jones on drums. 08 – Shirley Horn – “Where Do You Start?” from Shirley Horn with Strings: Here’s to Life (1992) – This is a very beautiful ballad and one of the two songs on this magnificent album where Shirley did not accompany herself. After I did the first radio blog of Shirley’s music, I got an IM one evening from someone asking, “Where is the break up song?” I guess I had always focused on the beauty of the song in spite of its unfortunate outcome. 09 – Shirley Horn – “Wouldn’t It Be Loverly” from I Love You, Paris (1994) – Shirley originally recorded this song on her Shirley Horn with Horns album which was originally mis-titled Shirley Horn with Horn even though she is holding four horns on the album cover. 10 – Shirley Horn – “The Folks Who Live on the Hill” from Charlie Haden Quartet West: The Art of Song (1999) – This one of the four beautiful ballads that Shirley recorded on Charlie Haden’s album. It is very warm and reflective. I also got my first exposure to vocal crooner Bill Henderson who also recorded several songs on this album. 11 – Shirley Horn – “The Boy From Ipanema” from Antonio Carlos Jobim & Friends (1996) – Shirley has recorded several Jobim song’s throughout her musical career. His ballads lend perfectly to her amazing use of space and silence in her music. For this album, she sings a swinging rendition of the classic “The Girl from Ipanema” with a little twist on the words to fit her impeccable taste. 12 – Shirley Horn – “You’d Better Go Now” from Glengarry Glen Ross Original Movie Soundtrack (1992) – This is where my love affair with Shirley Horn began. I bought this soundtrack, I played this song over and over, and when she sang “There’s a moon above and it gives my heart a lot of swing. In your eyes, there’s love and the way I feel, it must be spring,” my heart was hers for life. Johnny Mandel arranged and conducted this beautiful song. I was also introduced to the music of Jimmy Scott on this soundtrack. 13 – Shirley Horn – “Mack the Knife” from Loads of Love + Shirley Horn with Horns (1963) – I enjoyed what Shirley did with this Ella Fitzgerald classic. 14 – Shirley Horn – “Yesterday” from May the Music Never End (2003) – In recent years, when Shirley sang this Beatles song in concert, it would silence the room for her style was slow and reflective. She would sing “I’m not half the girl I used to be. There’s a shadow hanging over me.” and it would almost bring you to tears. 15 – Shirley Horn – “Old Country” from I Love You, Paris (1994) – This song was also a concert favorite especially when Shirley put that extra umph on “For don’t nobody neeeeeed no oooold man.” It would definitely make you smile. 16 – Shirley Horn – “Isn’t It A Pity” from Shirley Horn with Strings: Here’s to Life (1992) – Shirley enjoyed being able to tell a story with her music. In this Gershwin ballad, she sings of a romance that has finally comes together after years of these two people living their respective lives. 17 – Shirley Horn – “The Best is Yet to Come” from Your My Thrill (2001) – No one could accompany Shirley on piano better than she could. Nobody. 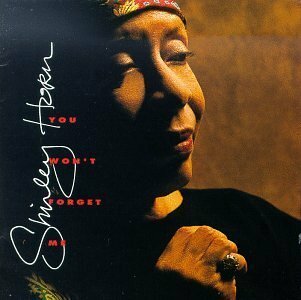 18 – Shirley Horn – “You Won’t Forget Me” from You Won’t Forget Me (1991) – After many years of mutual admiration, Shirley and Miles collaborated on this prophetic ballad and the result is magical. Their styles and phrasing compliment each other very well. In addition, drummer Steve Williams keeps a steady beat while Charles Ables produces a solid groove on the bass. Thank you very much for listening and stay tune next week for Disc 4 of My Shirley Horn Box Set, which will complete this wonderful radio blog series. This entry was posted on Monday, November 7th, 2005 at 12:16 am. It is filed under Radio.Blog, Shirley Horn. You can follow any responses to this entry through the RSS 2.0 feed.